Georgia’s irrigation industry has long supported certification programs and many contractors hold Irrigation Association (IA) certifications. WaterSense© (WS) is a partnership program created by the US Environmental Protection Agency intended to make water conservation easier for consumers. The Partnership program creates an easily identified brand for consumers to choose irrigation professionals and water efficient products. For example, WS certified new homes are independently certified to use approximately 20% less water than a typical home. It has been suggested that WS partners charge a premium for their service. So just how wild? 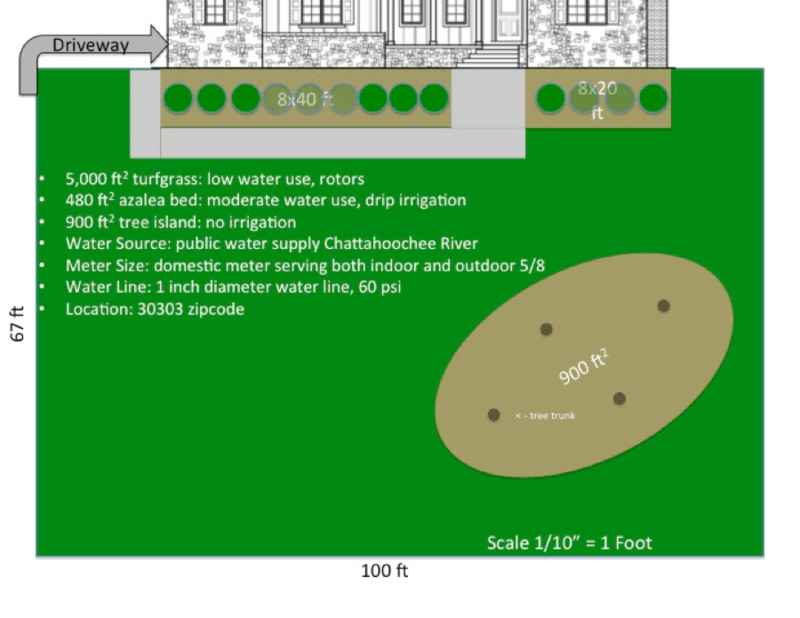 We designed a typical residential landscape plan using the WS Water Budget Tool (Figure 1). The WS Budget tool estimated the water budget of the test landscape at 10,685 gallons/month. This assumed the use of a smart controller, drip irrigation on the bushes in front of the home and no irrigation on the tree island. We asked contractors to provide a bid, identical to that which they would provide a potential customer, for the landscape. We solicited bids from over 31 irrigation contractors throughout the state of Georgia. WS partner irrigation contractors are listed on the EPA website and were contacted via telephone and email. Non-partners were contacted by telephone, email or by visiting their place of business. Non-partners were referred by the leadership at Georgia Green Industry Association, irrigation distributors and other irrigation companies. We received 11 bids for the job. Five were from WS partners and six were from non-partners participated in this study. Seven participating contractors were IA certified. Figure 1. All contractors presented a bid for this landscape. The bids ranged from a high of $3,480 to a low of $1,530 with an average bid price of $2,417. WS Partner bids with an average cost of $2,297, were not more expensive than non-Partner bids, which averaged $2,517. The seven IA certified contractors (average = $2,549) tended to charge more than the four, non-certified contractors (average = $2,188), though no statistically significant differences were found between bids for certified and non-certified contractors. With this relatively small sample, no clear indications of a geographical variation in price were noted, though the highest priced quotes were from areas north of Atlanta and prices tended to increase, as the companies got closer to the urban center. The content of the bids was also quite variable. Some contained considerable detail; others did not. One bid include detail down to the length of the wire and pipe to be used. Several did not specify equipment at all. One simply indicated all equipment deemed necessary would be used and others included little more that the number of zones. Three bids included drawings. Three bids included Hunter or Rain Bird brochures highlighting equipment or service. One contractor provided proof of certification. It may be challenging for the average consumer to assess the relative merits of one spray nozzle over another and certification does not guarantee excellence. Still, drawings, brochures and proof of certification seemed to suggested credibility and serious consideration of the job. Ten of the quotes included a backflow preventer. Nine of the quotes gave a warrantee of one to five years on equipment and/or installation. Through the green industry, low cost bids are often blamed on lacked business experience. There was no indication of a correlation between age of the company and the bid price. In fact the two lowest cost bids were from companies with many years of experience. Clearly, the contractors wanted to provide easy-to-use, reliable systems with low installation costs. Many systems were suggested in the bids. In addition to pricing, the irrigation contractors who participated in this study included comments and considerations on their bids. One expressed concerns about increased maintenance associated with drip irrigation. Another indicated that installation would be less expensive if the tree island was watered with turfgrass areas. Another chose not to use a WS labeled controller, noting that a smart controller in the hands of an uneducated manager could waste more water than a simple controller with a rain shutoff device. One contractor suggested eliminating the rain shutoff device to save money (this is a violation of state law). Interestingly six contractors included a WS labeled smart controller in the bids. Only two of the WS Partners used WS compliant controllers. Several noted pressure to deliver a low-cost bid to consumers. If Georgia’s irrigation industry represents the Wild West, there are many white hats out there. We are very thankful to the participants of this study. They took time out in peak season to help out and graciously returned calls and emails.